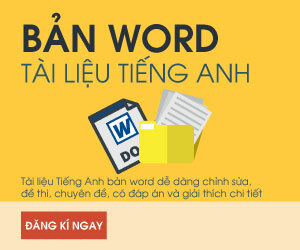 Nhằm giúp các bạn làm quen với các dạng bài tập viết lại câu trong tiếng anh, Thích Tiếng Anh chia sẻ tài liệu “Bài tập viết lại câu” do cô Mai Phương biên soạn. Tài liệu tập hợp những câu hỏi viết lại câu sao cho nghĩa không đổi rất hay, giúp bạn ôn tập lại các cấu trúc viết lại câu thường gặp, phù hợp với học sinh lớp 6, lớp 7, lớp 8, lớp 9,.. Exercise 1: Rerwite the following sentences that keep the same meaning. It isn’t necessary to finish the work to day. Sally finally managed to get a job. That’s the last time I go to that restaurant. “I advise you to take a holiday,” the doctor continued. If you don’t rest yourself you really will be ill. I should like someone to take me out to dinner. Martin may not be very well but he still manages to enjoy life. My aunt got heavily stressed because her marriage broke up. can’t believe that he passed the exam. Exercise 2: Rerwite the following sentences that keep the same meaning. This is the fastest way to get to the city center. If anyone succeeds in solving the problems, it will probably be him. ^ He is the most……………………………………………………………………………………………..
We arrived too late to see the first film. He wrote the letter in two hours. In spite of his age, Mr. Benson runs 8 miles before breakfast. I was very interested in our conversation. ^ It was interesting ……………………………………………………………………………………. These bookshelves are my own work. Exercise 3: Rerwite the following sentences that keep the same meaning. I don’t play tennis as well as you do. I haven’t been to the dentist’s for two years. Whenever she went to Paris she bought a new dress. I spent seven years at secondary school and then I went to university. It’s not worth living to make her change her mind. He said he was not guilty of stealing the car. Is this the only way to reach the city centre? Isn’* there………………. E……… I…. Thich 1…………………. i…… h……………. ? He never suspected that the money had been stolen. It’s my opinion that you should take more exersise. was going to leave, but because of what he said, I didn’t. Exercise 4: Rerwite the following sentences that keep the same meaning. He was very sorry that he didn’t see Andrey on her trip to London. It’s thought that the accident was caused by human error. “Will you be visiting the Taj Mahal when you go to India?” he asked Elizabeth. “Ithink you should try the chicken Marengo,” said the waiter. This is the most delicious cake I have ever tasted. Exercise 5: Rerwite the following sentences that keep the same meaning. The questions are so easy that everyone can answer them. Thích Tiếng Anh chia sẻ “Bài tập viết lại câu – cô Mai Phương“, một tài liệu rất hay để ôn luyện dạng bài viết lại câu, các bạn tham khảo nhé!